Jessica sailed behind Maddie's first year and wondered if he was going to make it through her class. "Have you found everything to your satisfaction, Mr. Domingo?" Keith had already produced his wand and set it on his workstation. The professor's voice startled him, but it was luckily only enough to make him yank his book out his bag quickly so he could turn around. Taken by surprise, he was not sure what she meant at first; the manners conditioned into him by his grandpa at an early age had simply kicked into gear as he said, "Yes, professor." He opened his book and started reading, pausing to see if she was going to ask him anything else. Once the professor gave her demonstration, Keith began to practice. It's a spell, like those that I've learned, he thought. I also have to visualize. Ignoring his neighbors after he watched them start their own assignments, he skimmed over his diagram and his book. "Escarabajo." he said, following the advice of his book and practicing the enunciation of the word as he heard it. Hopefully he was pronouncing it right. Next, he took his wand in his right hand and practiced the circular motion of the wand. As he separated a bean from the pile, he assured himself, That's right, I'm a wizard. I can do this. Keith wanted to make a good impression with the professors, unlike he had the other day. He tried to keep the image of the large beetle in his head alive as he cast his first spell of transfiguration. "Escarabajo," he said, targeting the bean. Jessica watched Keith point his wand and cast the spell. Of course, nothing happened. She smiled broadly. She placed her hand on his shoulder and spoke softly, "Mr. Domingo, the spell does not include impailing your bean on the end of your wand like it's a skewer." She took her wand out and demonstrated the movement once more for him. In order for your spell to work, you must properly roll the dice. 1: Type your reply and then click the dice icon above the reply box. 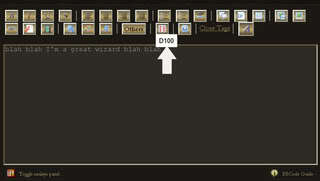 2: Click on the D100 when it pops up. 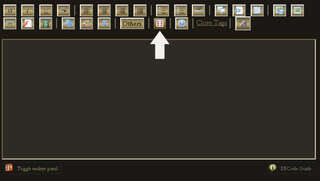 3: Leave the code AS IS at the bottom of your post and click SEND. Once you click send, the code will automatically generate a random number that will be used to determine what your spell did to the bean. Refer to the main thread for a breakdown of the numbers. "Are you now ready to proceed, Mr. Domingo?" "Yes ma'm." the boy replied. Keith flushed a little with embarrassment. Although he had felt a little sweaty since the lesson began, he was only starting to notice that the temperature was above what one would expect at this time of day. Trying to get a better feel for the wand movement, he practiced it a few more times before trying again. Practice, all I need is practice. Nothing. The bean remained unchanged. He thought that he might have been focusing a bit too much on making the correct wand motion. Keith turned to look at his beetle diagram, noting the legs and the different parts of the body. Thorax, head, abdomen, wings, I know this already. he thought, remembering how other kids in elementary school had both regarded and ridiculed him as a genius when all he had done was spout off facts from the Children's World Book series whenever he had the chance. Please turn into a beetle, he nearly asked the next bean. "Escarabajo." Keith spoke as he manipulated his wand. His wand slipped out of his hand and clattered onto the floor. Keith silently scolded himself as he bent over to pick it up. There was a tock sound as his forehead collided with the side of the table. A few of the beans off and onto the floor, bouncing and rolling in random directions as Keith fell onto his rear-end. He stifled any words that might have came out of his mouth and rubbed where he had hit his head. It felt a few degrees hotter in the room as he stood up, picked his wand back up, and gathered the scattered beans with his free hand before placing them on the table. He fought the urge to look around and find out who saw that just now or how everyone else was doing. Once everything was back in place, he refocused on his task. The bump had given him a bit of an adrenaline rush. He reviewed the wand movement, the appearance of the beetle, and the pronunciation of the spell. Attempting to piece together those three elements, he tried a fourth time. This couldn't be happening. No results at all. His wand felt as full of energy and life as it always did when he held it. This didn't make sense to him. He wondered what he could be doing wrong. Keith had noticed other students, particularly Kerry, getting visible results. A drop of sweat rolled onto his temple and he wiped it away with the back of his free hand. Putting the next bean before himself, Keith reviewed again. Come on, you're a beetle. he thought as he tried again. Results! He was relieved to see that he could actually have an effect on a bean. The bean/beetle hybrid clicked its mandibles and moved its legs feebly. Keith felt sorry for it only for a moment. The book did say that it would revert to its original form eventually. Brushing the odd thing aside and replacing it with another bean, he tried again. "Escarabajo." he said for the sixth time. Not to worry. he reassured himself. He just needed to remember how it felt when he got a result and find out how he was messing it up once he had a better feel for how it was supposed to go. He tried to focus on what a beetle normally was and how one naturally moves, using his half-beetle and diagram as a reference. Nothing again. Keith was beginning to feel discouraged again, too. Replacing the bean with another, he raised his voice a little when he tried the spell again. "Escarabajo!" Better. This beetle's legs still seemed a bit off and its back was still somewhat bean-shaped, but it was moving around. Thinking that he could do a bit better, Keith flipped it on its back and moved on to the next bean. "Escarabajo!" he said with a degree of certainty. This bean did not react to Keith. Looking around briefly, he noticed that Raven and Kerry had already left. A smile crossed his face as he noticed that Lina was still in the room. Noticing that he had been pretty hunched over during his last attempt, he straightened up. Trying to look and feel as confident as possible, Keith tried again, hoping a certain girl in the room would be watching if she wasn't too busy with her own project. "Escarabajo!" "Wow, I'm bad at this." he whispered to himself. Keith stole another glance at Lina and hoped that the professor did not notice. I guess it's okay, though. he thought, looking over his best result. Its six legs pumped uselessly up into the air as it bobbed from side to side. The rounded bean shape of its back did an excellent job of keeping the beetle incapacitated. Good for them that they didn't evolve like that. They evolved into THIS! He hoped for an ideal result as he spoke and motioned his wand. "Escarabajo!" Disappointed, Keith put the last bean into position. He took a deep breath, wiped more sweat from his slightly swollen forehead, and concentrated. This bean will grow legs, wings, and antenna. It will separate into an insect's three body segments and it will MOVE! he told himself. Gathering himself up, he put as much as he could into this last attempt. "Escarabajo!" Although he was disappointed, Keith felt good that he had tried so hard and at least got somewhere. He raised his hand and looked around for the professor. "Professor Kishna?" he got her attention.